Assuming you have a medium-to-firm mattress and no underlying conditions creating limitations, I generally recommend one of two positions, either sleeping on your back or your side. This is where you can skip the rest of the reading and just scroll down to the images….. The first one is for sleeping on your back. We also call this the “recovery position” in our office because it puts your spine in a very neutral position, allowing it the opportunity to recover and heal while you sleep. Note how the head is extended and the neck is arched. The back of your head should be close to, or touching the mattress. This promotes the natural neck posture we were all born with but then gradually lose, thanks to phones, desk jobs, poor posture, etc. The medical term is called cervical lordosis. A pillow under the knees helps to relieve the pressure in your low back that can build up while lying supine(meaning on your back, face up) for too long. I recommend this position to almost every patient with neck pain or tension headaches. If a medical professional has told you that you lost the curve in your neck or have been diagnosed with Upper Cross Syndrome, this may also be beneficial. If you are having an especially bad flare up, substituting an ice pack for your pillow in 20 minute increments throughout the day is also often helpful. Further, even if you can’t sleep an entire 8 hours on your back, we always recommended to at least try it for a few hours. If you are having upper neck and back symptoms related to stress and posture, anything is better than nothing. The second sleeping position we recommend is on your side. Once again trying to support the natural shape of the spine. See how your neck is supported by the pillow? The portion of the pillow under your neck should be slightly thicker than the portion under your head. I usually see too much pillow under the head and minimal support under the neck. This stresses the base of the neck and puts extra weight on your down shoulder. It is common for people with chronic shoulder issues to only be able to sleep on one side. Following this position closely can often increase the amount of time one can sleep on the painful shoulder side. The goal of the side sleeping position is to keep the spine parallel with the mattress. Referring to the diagram on the left, see how too much or too little cushion can put stress on the neck. And finally, don’t forget about the pillow between the knees. It will prevent pressure from building up in your low back and hips overnight. Notice how I did not provide a solution for sleeping on your stomach? I know we all do it, but it generally isn’t good for your neck, low back or shoulders. Some people get away with it, but I don’t recommend it. For the two endorsed sleeping positions discussed above, we recommend the Neck Bone Pillow. It is inexpensive and efficient. You can get one online including shipping for under $15.00. When sleeping on your back, the Neck Bone should be all you need. For side sleeping, you may also need a smaller pillow to support the side of head. 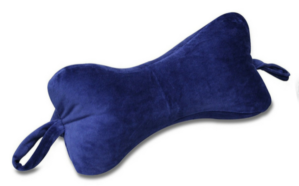 A horseshoe shaped travel pillow functions similarly to the Neck Bone but is sometimes a little too bulky. A slightly more expensive option but also a very good one, is the MyPillow. You have probably seen them on TV and wondered if they work. Well I have tried them out and they do. The adjustable foam allows you to sleep in a variety of positions comfortably. With reference to this article, it would be better suited to the side sleeping position, but if you are only going to have one pillow, the My Pillow if fine choice. Proper sleeping position is just one of the many things you can do to help manage and prevent spinal pain. For more ideas on how to manage your own low back and neck pain, visit our “do-it-yourself” page. I recently got a Neck Bone pillow and haven’t had any neck pain since. Smart Pain Solutions is the only place in St. Louis I could find them. Thanks for the tip. ← The importance of managing your own low back pain.